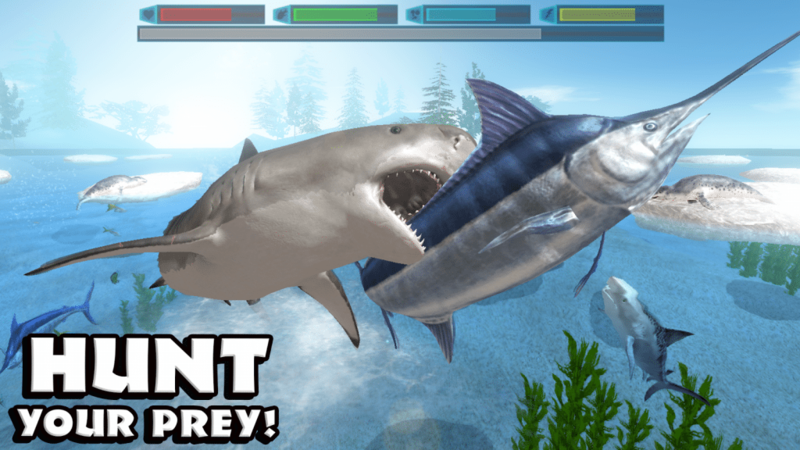 Sharks is a Predator-Prey simulator that creates a graphic population model. EGA/VGA required. S H A R K S ! studied. More importantly, it is FUN TO WATCH! The struggle is played out on an ocean of variable size. There are two kinds of creatures in the sea - sharks and fish. procedure over and over, the passing of time is simulated. in the form of lower sea animals. scroll off the boundries and reappear on the opposite side. for the sharks to eat. Must be less than 64.
the current food supply. Must be less than 64.
makes the sharks less vulnerable to local food shortages. Must be less than the shark breed rate. capture by the more cunning sharks. Vary from 1 to 4. "follow" that of the fish. safety of a sea with less predators. The system fails if conditions cause the loss of a species. cannot support the new predators' needs. independent variables could even be quantitized. struggle to a void wasteland of extinction in a flash. tures, and the time units could represent hours, or even years. Halts and displays command information on the screen. The sea is cleared, then restarted with new populations. chosen, otherwise the old ones remain in effect. statistically more vulnerable to extinctions. oppurtunity to make one move. - SHARKS! was created using Turbo-C 2.0 from Borland Internat'l. O F T H E U N I V E R S E !